HOLISTIC HEALTH: Instantly learn 12 insightful measurements of your body's health. FREE EUFYLIFE APP & 3RD-PARTY APPS: Track your measurements on Apple Health, Google Fit, and Fitbit. ACCURACY IMPROVED BY 10%: Two pairs of super-sensitive G-shaped sensors ensure more precise measurements. FOR THE WHOLE FAMILY: Track the health trends of up to 16 users from one account,recognise each member automatically. WHAT YOU GET: Smart Scale C1, AAA batteries x3, Quick Start Guide, User Manual, and our worry-free 15-month warranty. The rounded-glass top plate safeguards you from bumping into pointed edges. The anti-slip top plate and low, stable design ensure stability when you step on. Switch from pounds to kilograms and back in one second. Fast wireless data transfer means you can view your measurements in seconds. See all the historical data of your progress and health trends with ease. 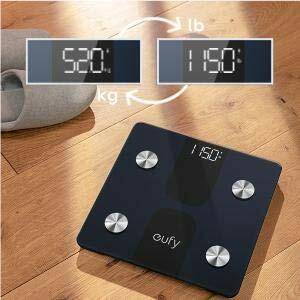 eufy Smart Scale C1 is intelligent enough to match measurements to the correct user profile, automatically. Why is my weight measurement inaccurate? 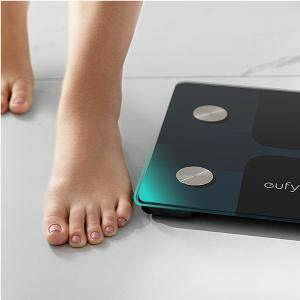 After installing batteries and turning the scale on, wait until ""0.0"" is displayed before stepping on the scale. Do not move while your measurement is being taken. After completing a measurement, wait until the scale turns off before picking it up or moving it. 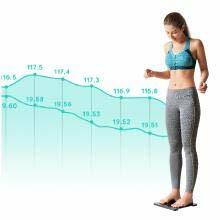 Can I sync the data with my phone after I step off the scale and the scale has turned off? Within 10 minutes. 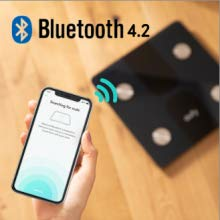 The scale will keep Bluetooth active when it is running or within 10 minutes after users step off it. The scale can store up to 100 readings and once a smartphone is connected, the data recorded on the scale will sync to the smartphone. Are all measurements displayed on the scale? The scale will only display the weight. All measurements will be displayed in the EufyLife app, which will also provide a graph for tracking your data. This scale says it can track up to 16 users. If a smartphone is not detected during a weigh-in,how does it select who is using the scale? Once you've set up your user profile, then all you need to do is step on and it will automatically determine which user you are according to your weight. The scale can store up to 100 readings and once a smartphone is connected, the data recorded on the scale will sync to the smartphone.